Mira Robertson is an award-winning screenwriter who has also published short fiction. Her feature film credits include the multi-award winning films Only the Brave and Head On, co-written with director Ana Kokkinos. Mira will be reading from her first novel The Unexpected Education of Emily Dean. We asked Mira some general bookish questions because we were interested in finding out more about her and this is what she had to say. 1. 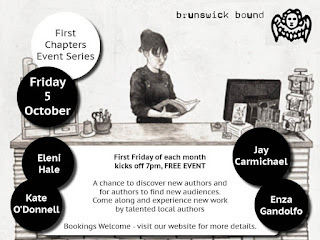 Brunswick Bound has asked you to read a chapter from your published work. Tell us what we can expect from the chapter you have chosen? From the chapter I’m going to read, you will be transported to a homestead in country Victoria circa 1944 where you can expect to meet some of the important characters in the novel, including Emily Dean. I think you’ll get a strong sense of her, as well as the tone of the novel, which has been described variously as funny, poignant and wry. 2. How would you describe the kinds of books that you write? 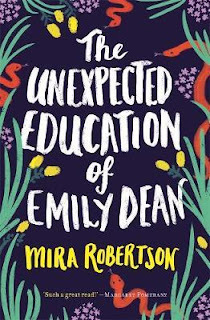 TheUnexpected Education of Emily Dean is my first novel, so I can only answer this question in relation to it. Whether future novels will be similar in tone, story, or theme, I can’t yet say. However, thinking about this novel, at one level it is a coming of age story with Australian forebears like My Brilliant Career, The Getting of Wisdom and I For Isobel. It’s concerned with the inner life – emotional and psychological – of the main character, Emily, and how she navigates the world at this very specific moment. At the same time, the novel also touches on all kinds of issues such as wartime xenophobia, class divisions, religious intolerances and even the transformative power of literature. It’s very Australian, being rooted in such a particular time and place. And it’s underpinned by a wry humour, as well as taking the reader to some quite emotional places. So, what kind of book is it? What kind of book have I written? Have I answered the question? I am not sure. 3. What was the first book that you read (or had read to you) that left an impression on you? The first story I can actually remember having read to me (by my mother) was Rikki-Tikki-Tavi from The Jungle Book by Rudyard Kipling. I’m sure she read this story to me and my siblings many times. It’s a short story set in India about a pet mongoose who protects a British family from two murderous cobras. Despite knowing nothing of India, and having never seen a mongoose or a cobra, this story absolutely fascinated me. The brave mongoose, the deadly cobras, and the life and death battles that ensued left an indelible impression. 4. Do you believe that books should answer life’s big questions? I don’t think writers have any special claim to know the answers to the big questions of life. Perhaps it is more that books should ask some of life’s big questions, and interrogate those questions in interesting, challenging, amusing, and all sorts of other ways. 5. What’s your go-to solution for writer’s block? If only I had a failsafe solution! I am prone to writer’s block so it’s a touchy subject for me. I do have a few different approaches to try and trick myself into writing. One of those is writing by hand with a trusty old fountain pen. Sometimes, abandoning the keyboard and returning to handwriting can have a liberating effect. I’ve found that scrawling words on paper, with lots of crossing out, ink blots and spelling mistakes takes the pressure off and seems to allow me more freedom to play. Sadly though, it doesn’t always work! 6. Which words or phrases do you overuse? You would have to ask my publisher, Aviva Tuffield, although I have sworn her to secrecy. 7. What do you put down as your occupation when asked? Screenwriter. Now I can say screenwriter and author, which is very satisfying! 8. What is the question that you hope never to be asked in an author Q&A? Answering this question seems like tempting fate. But to be honest, I don’t know. I suspect that I will have to be asked it first. 9. What question do you hope you will be asked and why? My hope is that an interviewer will be genuinely interested in my book and therefore have lots of thoughtful and possibly even surprising questions for me. I would like to be asked a question that reveals something about the novel that I haven’t thought of. I have heard it said that readers (interviewers) can be more perceptive about a work than the author and that’s fascinating, if a bit unnerving for said author! 10. Which book that you have read do you think should be better known or more widely read? I recently reread The Prime of Miss Jean Brodie by Muriel Spark and was once again blown away by how wonderful it is. Less is always more with Muriel Spark and this short novel brims with savage wit and, ultimately, aching sadness. Spark packs so much into the novel in a seemingly effortless way and Miss Jean Brodie is a magnificent, flawed character—charismatic, romantic, contradictory and full of hubris. In some respects, she’s a feminist and ahead of her times, but her fascination with fascism and Mussolini reveals a darker side to her that has tragic consequences. Oh, to write like Muriel Spark. But if you can’t, just enjoy reading her instead. Visit our website for more information about First Chapters. Julienne van Loon is a novelist and essayist. 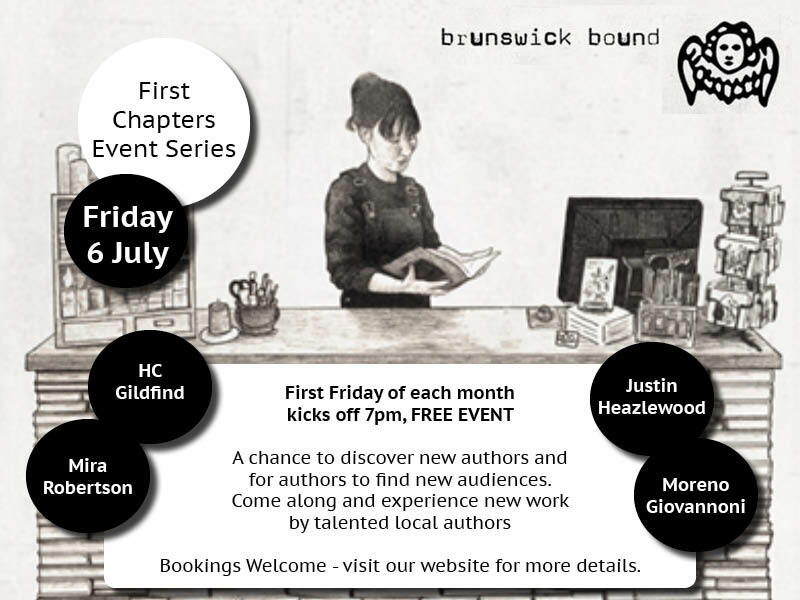 She is the author of Road Story, winner of The Australian Vogels’ Award, and two other critically acclaimed novels, Beneath the Bloodwood Tree and Harmless. Julienne currently works as a Vice Chancellor’s Principal Research Fellow with non/fictionLab at RMITUniversity. Previously she directed the Creative Writing program at CurtinUniversity on Australia’s west coast. 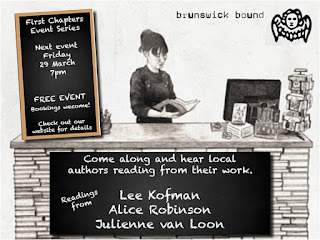 Julienne will be reading from her first non-fiction book The Thinking Woman at First Chapters on Friday 29 March. I’ll be reading an excerpt from one of the chapters in The Thinking Woman (New South 2019). This is a book that seeks to bring the work of leading women thinkers to a new audience and to apply their philosophical ideas to everyday life. 2. How would you describe the kind of books that you write? Harry Saddler is the author of We Both Know: Ten Stories About Relationships (2005) and Small Moments (2007), a short novel about the aftermath of the Canberra bushfires of 2003, both published by Ginninderra Press. In 2014 he was a join winner of the Melbourne Writers' Festival/Blurb Inc "Blog-to-Book Challenge" for his blog Noticing Animals, resulting in his third book Not Birdwatching: Reflections on Noticing Animals. His non-fiction writing about the ecological, physical and philosophical interactions between humans and animals has been published online at Meanjin and The Wheeler Centre, and in print in The Lifted Brow. He has twice been shortlisted for The Lifted Brow's Prize for Experimental Non-Fiction. 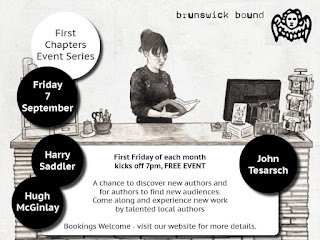 Harry will be reading at First Chapters on Friday 7 September from his latest book, The Eastern Curlew.